Version 2 WxShields are no longer available for sale. WxShield firmware sketch 5.0.2 is released. This fixes a bug where the Ambient Weather F007TH sensor could not be received if the option to receive pulse-spacing-modulation was enabled. Click on the download button at the top of this page to get this update (zip file). The version 1 CAD package has been updated to version 1.1, and supports the Bosch BMP180 barometer. The updated package is available now on the downloads page. The WSDL WxShield is an alternative to Oregon Scientific base consoles (for example, WMR100 or WMR200). 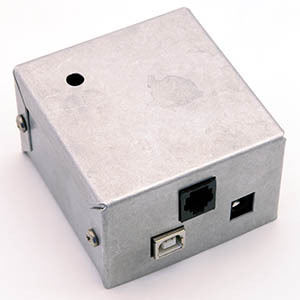 It is compatible with a wide range of sensor types, providing access to sensor data over a USB connection. The focus is on data collection for processing on a computer, and as such the WxShield does not have a display showing weather data; that task is left to the computer. There is also a more advanced design (version 2). This version can measure the signal strength of your wireless sensors. It decodes all of the signals supported by the version 1.0 WxShield, and can also decode the OS version 1.0 RF protocol. This is all open-source hardware; schematics and PC board CAD files are available without charge. In exchange, you agree not to hold us liable for anything related to the WxShields. Best of all, you can get five of these for the price of one THGR810! A CAD package is available for ordering custom PC boards for the version-1 WxShield. See here for more information. This has been updated to support the Bosch BMP-180 barometer (the original BMP-085 is no longer available). A video is available on the downloads page with instructions for updating the Arduino WxShield sketch. This is in MP4 format and may not play directly in your web browser. In that case, download it to your hard drive first before trying to play it. One user has reported that enabling AcuRite 5n1 support in the current sketch causes problems with reception of OS version 3.0 sensor signals. If you experience such problems, edit the WxReceiverConfig.h file and set both DETECT_WXSENSOR and DETECT_VN1TX to zero, then re-build the sketch. If this does not work, download and install the 1.9.2.1 version of the sketch. If you experience theses problems, please drop us an e-mail (wxshield -at- osengr.org).